On Wednesday afternoon, out of the blue, I get a call inviting Dorianne and I over to our Conejo Valley Wine Co-op wine maker’s home to taste a variety of wines made for the co-op from 1994 to 1998. The wines had been stored in a member’s cellar and he was no longer going to drink wine, so he was giving them to the current and former wine makers. We arrived about 90 minutes later to find 28 wines lined up on a counter in Richard and Mary’s kitchen, with a few more bottles in the refrigerator. The wines, now 16 to 20 years old, were a mystery. Most had not been opened for over a decade. Present were Richard Clark our current wine maker, his wife, Mary Stec; Dennis Weiher, the winemaker for the first 20+ years of the co-op’s existence; and John Trickett, an early member of the co-op who had helped make most of these wines. John is also the owner of the wines in question. 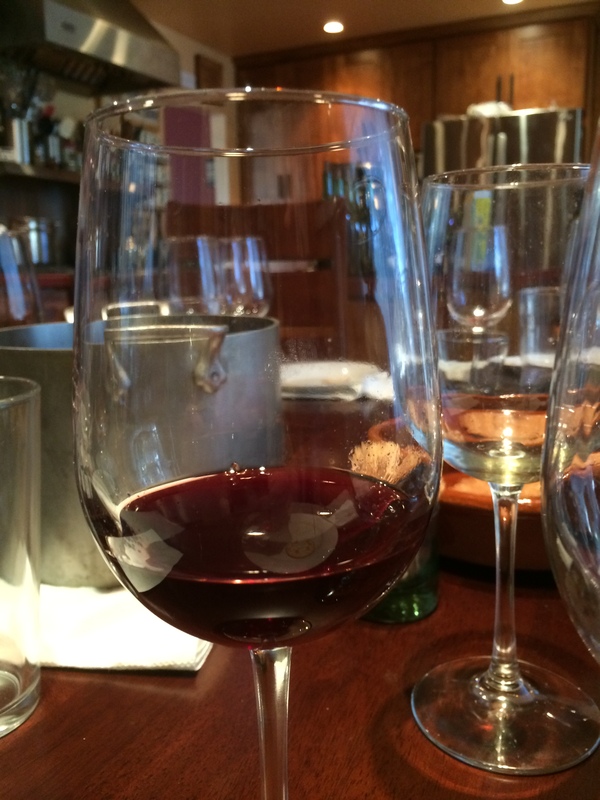 The wines ranged from Cabernet Sauvignon to Merlot to Zinfandel to Cab Franc to Petite Syrah to Freisa to Grignolino to Chardonnay to Semillon, to Riesling (in sweet and dry versions). There was even two kinds of Meade – regular honey Meade and a clover Meade. Glasses at the ready, water, a bit of cheese and some crackers, dump and spit buckets, and we began. We worked our way through, varietal by varietal, with relevant blends in between. The co-op wines are made Garagiste style, meaning in this case in a suburban driveway/garage. Fruit was sourced mostly in the Santa Ynez – Paso Robles – Los Alamos areas by Dennis and John. They were essentially experimenting with various wine making techniques in fermentation and storage. Because of this and for myriad other reasons, we did not know how much, if any, of this wine would still be good. The first pass through, we came up with a few winners – three whites of five, a Chardonnay, a Semillon, and the sweet Riesling had held up very well – good color, nice nose, and drinkable to very drinkable. All but the merest trace of fruit was gone in most of these wines, but they had aged well. The reds were literally all over the place. Three were nice right out of the bottle – especially a Cabernet Franc that would rate in the high 80’s to low 90’s; a Cabernet Sauvignon from 1997 was a winner, and a Merlot from 1998.. 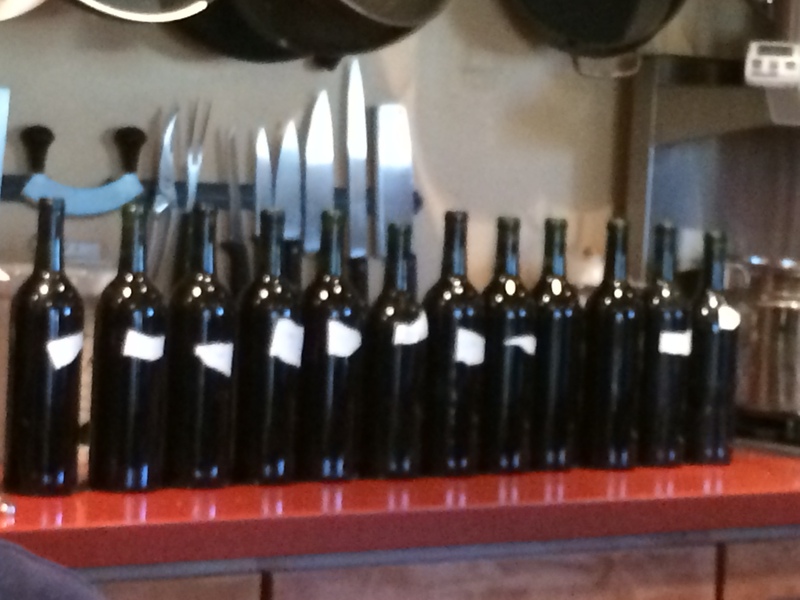 Seven wines were set aside to open up, and the other 16 reds were undrinkable. John Led Us Through His Co-op Library. Then dinner – Mary had “whipped up” pasta pomodoro and a big bowl of clams, mussels and crabs in a light tomato sauce, and some cole slaw. The Cab Franc disappeared during the dinner. We moved to the dessert wine and Meades after dinner. Mary brought out some homemade coconut sorbet to help us along. 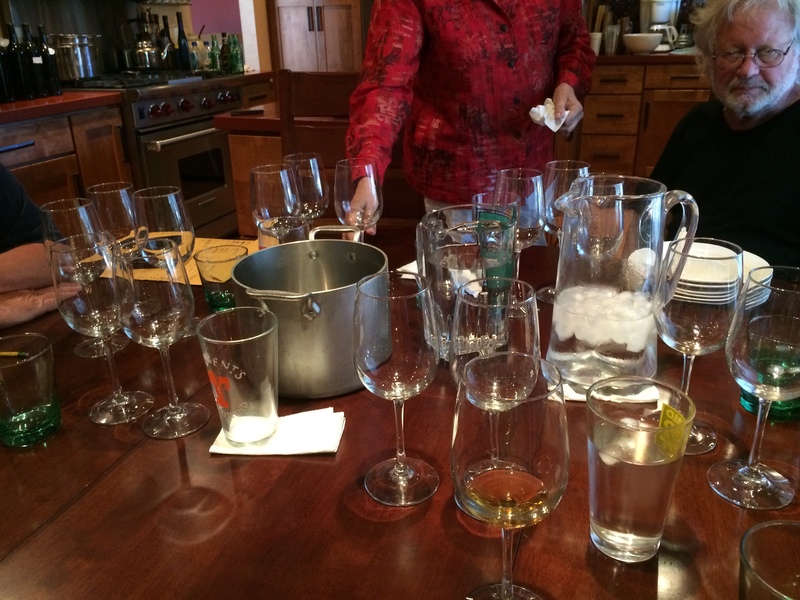 The sweet Riesling was simply amazing – as good a dessert wine as I have had. It was balanced beautifully, with a very nice nose, viscous mouth feel and a very pleasant aftertaste; the bad news – only two other bottles left. The honey Meade, too, was beautiful – viscous, sweet, but not too sweet, and a very nice aftertaste. The clover Meade was poured over the sorbet and tasted from the glass – it was elegant – sweet and savory with a very nice mouth feel. Excellent. This was a rare opportunity to explore and to realize that amateur winemaking can, indeed, produce nice, drinkable wines that will age. The co-op wines have improved over the years, as the winemakers have learned more about their craft. I can’t wait to taste the 2014’s in about 20 years. It was a delight to taste these wines – also a nice surprise that the 3 whites aged so well. I wasn’t a fan of the meade, but everyone has different preferences. It was a fun and educational evening with good company and conversation. 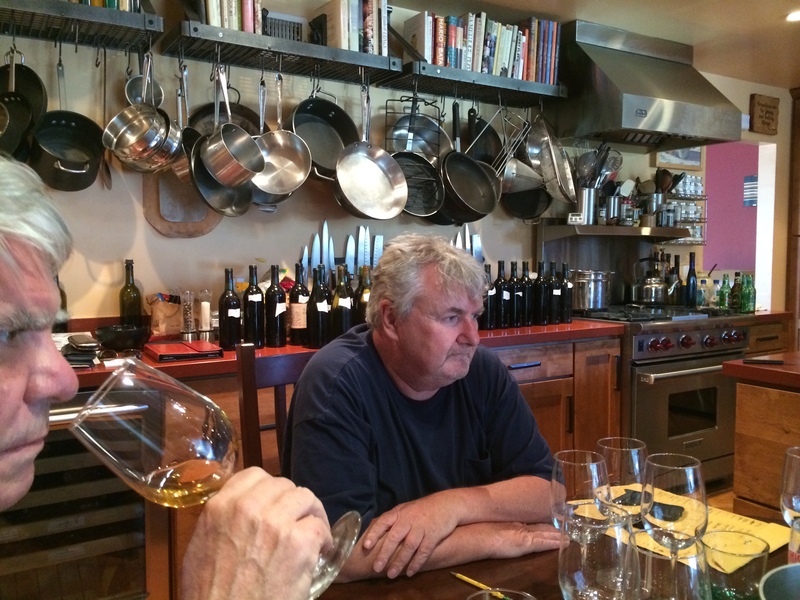 John has an amazing memory and recalled the story of each wine including where the grapes were sourced, the thought process behind the blending and a few extra pieces of wine wisdom and reason. Hopefully, in another 20 years or so, we’ll all get back together and sample the wines we’ve made in our garage..